I spent a day with the team at Microsoft Netherlands - thanks to These Days. In this post, my thoughts are not about web analytics or the future of the industry - visiting Microsoft got me thinking about how we are working today and how we will in the near future. Every Microsoft employee is empowered with a fully loaded and powerful laptop running the latest Windows 7, Office 2010 and a slew of other Microsoft (and non-MS) tools. If Microsoft aims to "make it great" it needs to understand the behavior and expectations of its users. Back in my days as a sysadmin and webmaster at Softimage (then a subsidiary of Microsoft), the "eat your own dog food" mentra wasn't an obligation, it was a pleasure! 93,000 employees in 100 countries (Wikipedia) makes for a pretty good test bed. I used to work on three, sometimes four computers. Now I only use my laptop which I will sometimes hook up to a bigger screen, keyboard and mouse. At any given time only a third of Microsoft.nl employees are in the office - the others are working from home or wherever else. 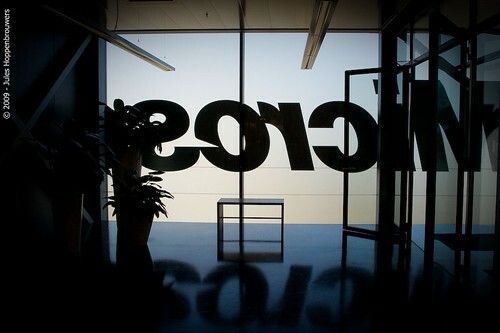 What is striking about Microsoft.nl office is... the space! It doesn't even look like an office, it looks like a cozy modern hotel lobby. There are areas for meetings, for inspiration, for open conversations or if you need to be calm and focused you can go into sound proof cubicles. Of course, there are also the relaxing areas, gaming and a Microsoft Surface table. Food is great and drinks are plenty - just like home. The office is just like home, home is your office, your office is anywhere. The Microsoft.nl office is clearly set up to facilitate formal and informal social connections. For that matter, my little experience confirmed two stereotypes of the Dutch: 1) bicycles are everywhere and 2) there is a vibrant at-work and after-work lifestyle. The only real conversion of any social media is getting to meet someone in real life. People come to Microsoft.nl offices from all around the world - sometimes just to see and understand the evolving workplace dynamics. Over the weekend I spoke to someone who's employer thought "it would be cool to have iPads for everyone" but still requires them to show up at the office from 9 to 5... they don't get it! We, web analysts and online aficionados, are living in a microcosm ahead of the mass - we are lucky but it's a curse - lets not forget it. For more info about what's so special about Microsoft.nl office, check out "New World Of Work Microsoft Netherlands Case Study" on Slideshare.